Isn't an anagram a word game where letters of one word are rearranged to spell another word or series of words? For instance, an anagram for 'microwave' is 'warm voice,' one for ''resistance" is "ancestries," and for "vector" is "covert." If so, then this puzzle is misnamed; it is really a crossword puzzle. 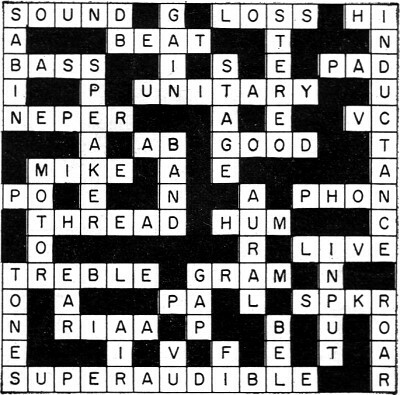 Maybe back in 1961 the word anagram included this type of puzzle. Regardless of the naming error, I did learn a new word: "inertance," which means "the effect of inertia in an acoustic system, an impeding of the transmission of sound through the system." 4. Sound energy dissipated without accomplishing any work. 6. Part of familiar term for full-range reproduction. 8. A regularly occurring pulsation of amplitude resulting from the combining of two sounds or tones. 9. Opposite of treble sound frequencies. 12. Device used in a sound system to attenuate a signal or couple two impedances. 13. Term often applied to a coaxially constructed speaker. 14. Electro-acoustic unit of power ratio based on the Napierian base of logarithms. 15. Coil found in speakers (abbr.). 16. Class of audio amplification. 19. 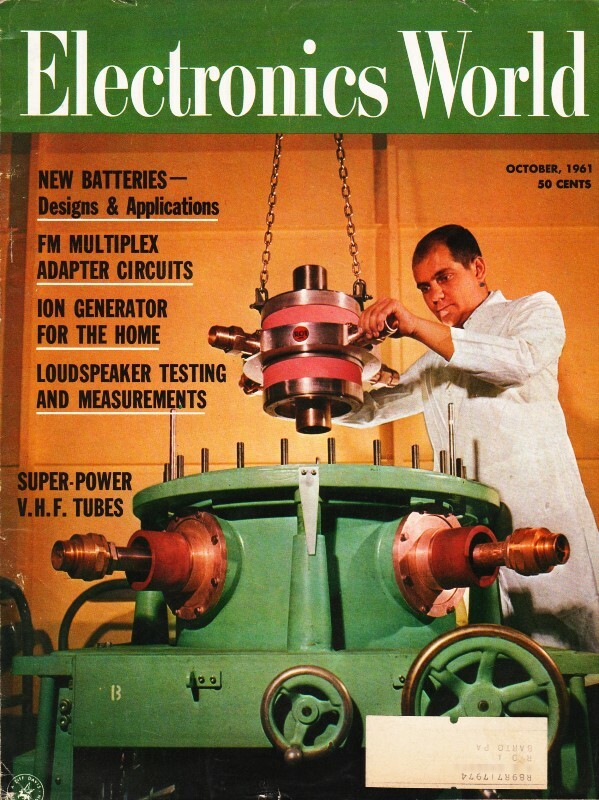 Transducer that picks up sound and converts it into electrical currents (fam.). 23. Material removed from surface of phonograph recording disc by the cutting stylus. 22. Undesirable noise in an audio system. 24. Opposite of a "dead" or highly damped room. 29. Unit of stylus pressure. 30. Equipment used to address large gatherings (abbr.). 31. Essential component in a hi-fi system (abbr.). 33. Recording companies' trade association (abbr.). 38. Frequencies above 20,000 cps. 1. Unit of sound absorption. 2. Electro-acoustic unit of relative power, voltage, or current (abbr.). 3. The amount that an audio amplifier can increase the amplitude of a signal. 5. Sound in its "third dimension." 10. Transducer used in every audio system. 11. One circuit of audio amplification. 19. The part of a speaker that receives power from the electrical circuit and converts it into mechanical energy. 21. Pertaining to the ear or sense of hearing. 26. The "receiving" circuit of an audio amplifier. 28. Organ used for the perception of sound. 29. That portion of a magnetic circuit in which there is no ferromagnetic material. 34. Medium through which sound waves travel. 36. Meter watched by recording en­gineer (abbr. ).